"When the sun rose the villagers were awoken by the ghastly cries of a hairy human-like creature that had become glued to the back of one of the horses." Ines Cerro/KH. 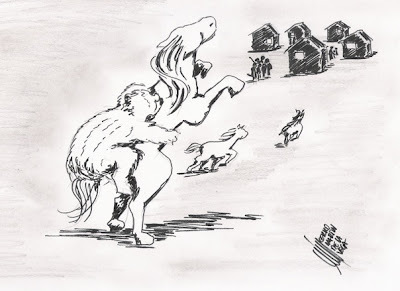 Does Shurale, mythical creature of Tatar folklore, have something to tell us about the Russian Yeti? The world’s media has recently zoomed in on the Kemerovo region in Siberia. There, American and Russian investigators have joined forces to find the “snyeshni chyelovyek,” the snowman, or Russia’s very own Bigfoot, which is said to stalk the area. Dogged by the inevitable hoaxes and cultural confusions, many nevertheless hope that this search begins a new period of East-West cooperation in finally trying to crack this ongoing enigma. Russia’s involvement in the snowman problem has not always been the risible issue on the fringes that it has since become. In 1958 the Soviet government saw fit to fund a “snowman commission” to seek out the basis for Wildman’s reports which from the Pamir Mountains. This was headed by Professor B.F. Porshnev and his hypothesis was that the Russian yeti was a relic of the Neanderthal, the much sought after missing link, bridging apes and humankind. Eight years later, this idea appeared to be strengthened when another yeti-expert, Doctor Jeanne Marie Kofman, addressed the Russian Geographical Society in Moscow and unveiled an identikit picture of what the snowman would look like as based on many eyewitness statements. A member of the audience then came forward to say how much this resembled the latest artist’s impression of a Neanderthal man, based on fossilized remains. In Tibet the yeti is a quasi-mythological deity which is an inclusive part of the local Buddhist cosmology. For the Native Americans the “sasquatch” is a similar legendary creature to which magical powers are ascribed. If, indeed, there were a Neanderthal-related hominid existing on the outskirts of human society, then would not one expect the folklores of the world to tell of this? With this in mind, it is time to take a fresh look at the “shurale” of Bashkir and Tatar folklore. Surale (Tatar: Шүрәле), seated at the right in this sculputre in central Kazan, is a Tatar and Bashkir mythical creature who according to legend lives in the forests, luring his victims and tickling them to death. Tatar poet Ğabdulla Tuqay wrote an epic poem based on the legend. Maxim Edwards/KH. Sabirzyan Badtretdin, writing in the “Tatar Exclusive Web Gazette,” recently recounted a local tale that has been passed down from grandfathers to the current generation. According to legend, horses had been going missing from the village during the night and were discovered the following morning in an exhausted condition. As this could not be allowed to continue, the village elders were consulted as to what to do next. Their advice? To cover the horses’ saddles in tar and then to release them. Sure enough, when the sun rose the villagers were awoken by the ghastly cries of a hairy human-like creature that had become glued to the back of one of the horses. This was promptly slain and, it was, of course, recognized as being Shurale. This macabre little account could easily be dismissed as merely a fireside tale, but it does find an echo in a better-documented story. In January 2002 the Russian Journal “Ural Stalker” carried a report by the biologist Nikolai Avdeev. This told of a Wildman who had appeared in the vicinity of Ibramigova village in the southern Urals and which had been blamed for the killing of domestic animals. This too was eventually captured and killed and was personified as shurale by the local Bashkirs. However, in this case, officials from outside the area had a chance to inspect the body. They described it as being covered in black hair, having red eyes, a pronounced brow and no forehead – and being reminiscent more of Bigfoot than of the nimble fingered horn headed Shurale. This would not be the first time that a folk tale was found to have some grounding in fact. Vietnamese forest dwellers had long told stories of a large antelope creature which lived nearby, but this was not given credence by zoologists. After the discovery of some horns, an expedition was mounted which resulted in the discovery of the saola, a rare mammal known as the ‘Asian Unicorn’, which was only accepted by the mainstream science as late as 1992. For the time being, in spite of the flippant attitudes towards it by many, there is an international race afoot to capture the ever elusive yeti. Just maybe, Tatarstan may hold one of the missing jigsaw pieces to this intriguing mystery. HULIQ.com is an independent news organization and is owned by Hareyan Publishing LLC. Currently HULIQ has 16 reporters and 3 editors. Today the file a report on the Bigfoot Field Researchers Organization: The video they reference is from the Todd Standing episode. According to the Bigfoot Field Researchers Organization—or the BFRO, as Matt Moneymaker typically refers to it on the Discovery Channel show Finding Bigfoot—the term “sasquatch” is an anglicized derivative of "Sésquac,” a word in the Stó:lõ dialect of the Halkomelem language meaning “wild man.” In Canada, where the team is heading in tonight’s episode of Finding Bigfoot, “sasquatch” is the more common term used as opposed to the popular “bigfoot” in the United States. In the mid-20th century, the media created the term “bigfoot,” the BFRO indicates, during a rash of sightings in the area of northern California. Since then, the term has become popularized, although Native Americans are reported to have more than 60 different names for the elusive—maybe non-existent—creature. Terms used by pioneers of North America, as well as non-native inhabitants, include “skookums” and “mountain devils,” the BFRO says. According to the BFRO, there has never been a serious effort made to discover natural remains of any type of ape in areas where they are rumored to live. And, as remains are unlikely to become fossilized, they become completely reabsorbed into the ecosystem over time. “No one should expect remains of such an elusive species to be found, collected and identified without some effort,” the group says. Some people suggest that there should at least be “roadkill” bigfoot, or bigfoots killed by hunters. However, the BFRO says that there have been no credible reports about a vehicle colliding with a bigfoot. Additionally, they explain, bigfoots seem to be far more intelligent than other species that do get hit on a regular basis, such as deer, that become “dazzled in the headlights” of oncoming cars. Bigfoots, they say, actually make an effort to stay out of the way of vehicles. And, as far as hunters go, not only are there laws in place that could make killing a bigfoot a potential crime, most hunters who have claimed to have had encounters with a bigfoot, the BFRO says, simply said they did not initially know what the creatures were, and they were so human-like, they did not feel comfortable shooting at them. For more information on bigfoots, visit the Bigfoot Field Researchers Organization website. In our previous post, "Dr. Jeff Meldrum Speaks at Wofford College," we alerted our fans to Meldrum's speaking engagement to Wofford students studying "urban legends" during the January Interim. The Spartanburg Herald-Journal is a daily newspaper, and the primary newspaper for Spartanburg, South Carolina.The Journal covers what happened at the event in the article below. Published: Sunday, January 22, 2012 at 3:15 a.m.
Last Modified: Saturday, January 21, 2012 at 11:36 p.m. When a class of curious Wofford College students began debating the fact, fiction and in-between of popular urban legends, they recently turned to a widely known expert to find out more about one of the world's age-old phenomenon — Bigfoot. Jeff Meldrum, a professor of anthropology at Idaho State University, spoke Friday to students in accounting and finance professors Ryan and Jenny Johnson's Interim course, Urban Legends: (Mostly) True Stories Verified by a Friend of a Friend. Interim opportunities are available to all Wofford students during the month of January each year. The classes aren't usually the traditional academic courses students are used to, but a time for exploration and experiential learning. So for another week, the 32 students in the Johnsons' Urban Legends course are exploring the truth — or lack thereof — behind popular stories, such as whether trick-or-treaters should inspect Halloween candy for dangers or if catfish the size of Volkswagen Beetles swim near the base of a Colorado River dam. “It's an interesting topic. The focus of our class is not always if it's truth or fiction, but that people choose to tell the story,” Ryan Johnson explained. “We're not trying to debunk anything,” Jenny Johnson said. On Friday, Meldrum signed books next to plaster casts of could-be Sasquatch footprints — examples of the evidence he's personally discovered during years of research on the elusive “wild man.” A known expert on primate locomotion, Meldrum has appeared in a number of documentaries for the Discovery Channel and has written several books on the topic. Meldrum said he enjoys speaking to college-age students because they're usually open to novel ideas and weigh points on their own merits. Meldrum told students that he personally operates under the hypothesis that the creature known as Sasquatch most closely resembles a form of ape. He said that tales of similar creatures have been passed through the generations in many of the world's cultures. Taking a scientific approach to the subject, Meldrum discussed the evolution of ape-like mammals that could have, over time, traveled to and settled in various places around the world. “The prospect that some of them might have existed into the present isn't so far-fetched,” he said, pointing to casts of footprints he first personally encountered in 1996 near Walla Walla, Wash. The tracks closely resemble a human's but are significantly larger and show a pressure ride in the center rather than an arch. The flex at the mid-foot, Meldrum explained, is more similar to a chimp's. 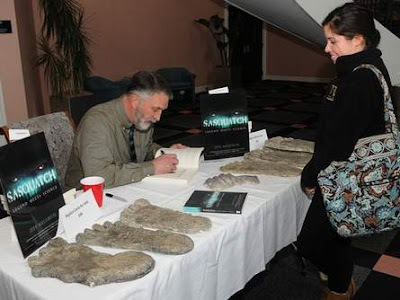 Meldrum told students that one of the themes of the Urban Legends course — and stories like that of Bigfoot — is that there is no history without myth and said he's gained an appreciation for folklore and tradition through his scientific study. Wofford senior Dominique Cox said Meldrum's presentation made her think. She called the Urban Legends Interim the favorite of her college career. “The stories are so outrageous sometimes, but there's always a grain of truth to it, so it could be true,” Cox said.